Eventually "implemented" my upgrade! I certainly did not think it would take me so long, but once you start to sort the mess that's below a 3D printer you just can spend days on it! There is a brief list after the break. I am sure a lot of 3D printer owners share the "two minutes into two hours" syndrome. Sorted some cables: cleaned up the mess, shortened some, refreshed the aging connectors before they start to fail. Fully replaced the main cable from the bottom to the head, by means of a high quality Ethernet cable (I feel confident). Used lots of JST 2 and 3 pin, with a high quality crimping/terminal pliers (ref. "Engineer PA20" worth its $75, ouch -- also have a very good wire stripper from the same Japanese brand). I failed to select the proper crimps at first (I was "close" but it is clearly not enough to be close!). I should have payed more attention. At last I now have a proper dual power supply (5V and 12V, based two high efficiency, low temp and cheap LM2596). Will power whatever I need without having to deal with 19V or to load further the existing inefficient linear regulator on the RAMPS. Re-did my secondary Arduino Pro Mini. This time it is clean! I used some proto board. The secondary Arduino, screen and encoder will give me a lot of freedom for further enhancements. Too bad I have only one wire left from the Ethernet cable to the head, but at least I now have proper 12V and ground, with one more free wire (eg. I could multiplex control signals with I2C and an ATtiny when I need it). For now I can tune the bed temperature (was either 0 or 55°C before), PWM for the hot end heatsink fan (was very noisy at 100%), and PWM for the LED lighting (quite useless but I can switch them off at least now). 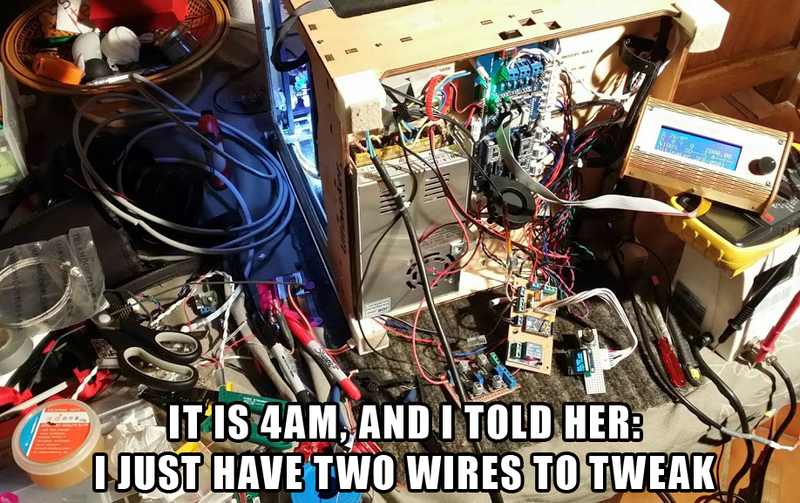 I know, I should switch the bed control to the main board & firmware. At least I do not interfere further with Marlin even though it is trivial to disable the bed PWM. Going "bang-bang" with a 2°C hysteresis on a mechanical relay really is enough for me. I can even hear when it is heating (but now I have it displayed on the pretty little oled screen). Shorten all these long stepper cables. Why are they so long in the first place?! I could keep on listing tens of ideas here... stay tuned! Why you should not buy Makerbot 3D printers!